I’m Sick of this BS but here is another BPI S.C.A.B. 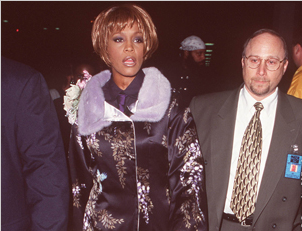 The unfortunate death of famous singer Whitney Houston could not go a year without her former bodyguard [yea bodyguard] Alan Jacobs trying to cash in on his failed career.According to his interview with Celebuzz!, Jacob is a “former soldier and security expert, and worked for Houston from 1995-2002, during which he became a close eyewitness to Houston’s tumultuous relationship with her husband, Bobby Brown.” He stated in the interview, “It was the pressures of fame, in addition to her marriage, that ultimately led Houston — who died Feb. 11, 2011, inside the Beverly Hilton Hotel — to become a full-blown addict. Really Mr. Jacobs? So you’re a clinical psychiatrist as well because that’s a bold statement coming from someone that has a problem upholding one main principle to our creed – Keeping you cake hole SHUT! In the interview he claims that he quit working for Houston after he could not convince her to get off drugs. That’s admirable, but in the same interview he stated that, “Her death would not have happened on his watch.” It is a logical fallacy to think she died because you weren’t there. Or should I surmise that she would still be alive if you had not quit? Which one is it? The fact is this, your career was dead and you using her death to somehow pump your failed career back to life. That’s where the truth lies sir! The SCAB also stated that with the drug problem it became more difficult to work for Houston because her family became increasingly more intertwined in her personal and professional life. We should all quit as soon as families are involved with our Principal’s lives. Hell, I am quitting right now – NOT! It’s already bad enough that this SCAB had decided to talk but when I read the Inside Edition interview [yea he’s on a circuit] and he said, “That when he worked as Houston’s bodyguard he insisted she take showers, never baths. And he would never have allowed her to be in the bathroom for a full hour without checking on her.” He never stated why, and it really isn’t any of our business, but don’t you think it’s convenient for him to say that since these are the conditions in which she was found? I can’t write anymore about this joker but I will end this blog with this. I have heard that Mr. Jacobs is a nice guy and maybe he is when his mouth is shut. This is yet, but another, sad chapter to our CRAFT. The former bodyguards of Michael Jackson and Whitney Houston will now share their rightfully do places on the “Wall of Shame”. They were never on the roll call for executive protection specialist because a true protection specialist NEVER talks whether their client is living or dead. Those stories die with us.